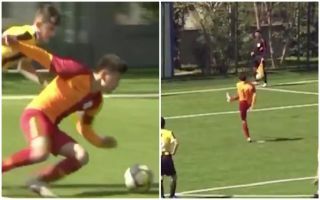 Beknaz Almazbekov has become a viral hit after showing great sportsmanship while in action for Galatasaray U14s. As seen in the video below, the 13-year-old took a tumble and was awarded a penalty. However, replays suggest that he lost his footing and went to ground rather than a defender committing a foul, although that didn’t force the referee into reversing her decision. In turn, Almazbekov took matters into his own hands and missed his penalty on purpose, sending it well wide in order to avoid scoring in unfair circumstances. This is great sportsmanship at any level, but to see such a young player take this action in the spirit of the game is great to see and it’s hoped that it serves as an example and inspiration for other aspiring young footballers.